Thompsons Park, previously known as Sir David's Field (Cae Syr Dafydd), occupies a 10 acre site in the Canton area of Cardiff. The original name is thought to be derived from Syr Dafydd Matthew, who lived in the 15th century and was granted land in the parish of Llandaff for services to the King (Edward IV). In the late 19th century this land was owned by Mr Charles Thompson, a member of the wealthy and philanthropic Thompson family, who lived nearby at the property called Penhill. In 1891 he opened a garden on the site to the public. The Western Mail reported: "Mr Charles Thompson, a Cardiff Merchant, has handed over for the use of the residents of Cardiff, subject to certain stipulations, a small garden and field with a splendid view in Romilly road." In 1895 the garden was enlarged and formally laid out by the landscape gardener William Goldring. By 1908 there was a private bowling green, at the northerly (Pencisely Road) end of the park. This became the home of the Penhill Bowling Club and was not part of the park. In 2012/13 the site was sold and houses built there. By 1911, when Charles Thompson indicated that he wished to hand the site over to the Cardiff Council, it was popularly called Thompson's Park and was described in a newspaper report as a "delightful and beautiful open space in Canton" with "flower beds, well-kept lawn tennis courts, an artistic fountain and a miniature lake." In his letter of November 7th 1911 offering Sir David's Field as a gift, Thompson imposed a number of conditions, including that the Council "covenant to empty and cleanse the pond yearly", and that it renounce the right to sell or build on the portion of Llandaff Fields over which it then had such rights. He wished the whole area to remain an open space, and if his terms were accepted, Thompson was willing to continue to manage Sir David's Field at his own expense so that the Council would incur no additional costs. He also wished the name of Sir David's Field to be kept (rather than Thompson's Park). The Council accepted these terms and ownership was formally transferred on 22nd August 1912, with Thompson officially appointed as manager on behalf of the Council. The land transferred to the Council (which excluded the wooded area known as The Dell) was marked on the ground with boundary stones. Thompson carried out his role as manager for a further eleven years, and he purchased and gave to the Council three additional strips of land in 1913, 1918 and 1919 to protect the boundaries of the park from building on surrounding land. In October 1923 he notified the Council of his wish to step down as manager and asked that the Council take on the employment of his three gardeners and three caretakers. The Council agreed and assumed full control of Sir David's Field on 3rd April 1924. The first annual estimate of expenditure in 1924-25 was £797. An additional piece of land was conveyed to the Council in June 1933. This was the sloping wooded area on the eastern side known as The Dell, which linked the high ground at the north end of the park to the southern (Romilly Road) end. Some of the boundary stones were adjusted to reflect this. Ordnance survey maps show that the path on the east side of the lake, which now connects the lower and upper sections of the park via The Dell, was created between the 1950s and 1970s. During the 1939-45 war there was an ARP (Air Raid Precautions) wardens' post in Thompson's Park and an emergency water supply tank for the use of the National Fire Service. It is thought to have been in the upper park, immediately south of the bowling green, where there is now a large open space. By 1945 concerns were raised about the dangers of these being left full, particularly the one at Thompson's Park, and the Fire Service was asked to expedite the emptying of all water tanks in the parks. In May 1946 the Director of Parks reported to the Parks Committee that all emergency water supply basins had been removed and he had made a claim for restoration of the sites to their original condition. Bomb damage occured at Thompson's Park on the night of January 2nd 1941, as the Chief Parks Officer reported to the Parks Committee. The remains of incendiary bombs (ten fins, each surrounded by a pyramid of white powder) were seen on the football field at the north end of the park, while at the south end there was a large mound of earth, 10 or 12 feet high, against the perimeter wall, and a large bomb crater some 20 feet across. The bomb had missed the end house of Preswylfa Street by a few feet. The 1938 Buildings and Equipment Inventory listed a Propagating House, Boiler House and Combined Potting, Mess & Tool House among others. These were in the lower park, on the eastern boundary, and they were still there in the 1980s. In the 1990s there was a playground in this location. 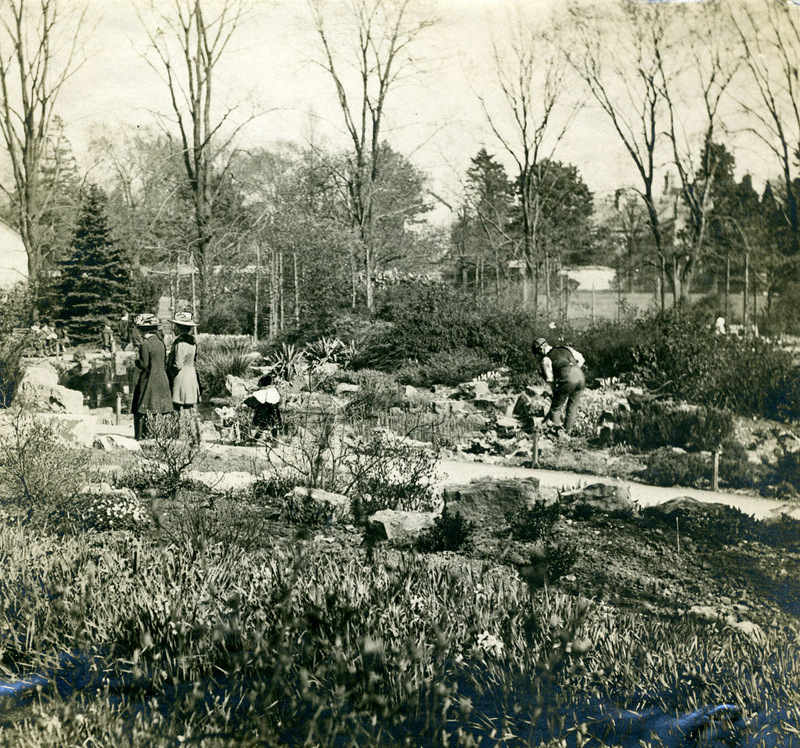 The area just north of the lily pond shown in 1940 with a single greenhouse changed significantly after 1954. More greenhouses were added together with a mess-room for the use of parks service staff. For a short period there was a children's playground in this area but this proved to be unpopular with local residents and was removed. The modern Thompson's Park retains some of the original features, including the "miniature lake" and the pond with statue and fountain at the south end. There are also many trees and shrubs and extensive grassed areas for general recreational use. The notable trees include several that are rare, as well as a group of Irish yews (Taxus baccata 'Fastigiata') at the Romilly Road end. The park is best known for 'Joyance', the statue created by Sir William Goscombe John and installed in the fountain pond in 1899. A small hill at the north end provides views over the Vale of Glamorgan. An unusual feature of the park until the summer of 2013 was a giant tree carving of a 'green man' on the easterly lawn at the southern end.